SSgt. 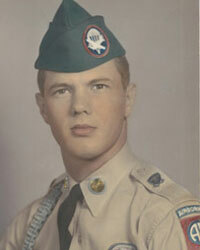 Johnnie William Faircloth, born in Cairo, Georgia, February 13, 1939 to Horace W. and Myrtle Rhodes Faircloth, joined the Army in 1956 on his 17th birthday. He completed basic training at Fort Jackson, South Carolina, was transferred to Fort Bragg, North Carolina, and the 82nd Airborne Division. After completion of jump school at Fort Bragg, SSgt Faircloth completed a one-year tour with the 1st Calvary Division on border patrol in South Korea. He was then transferred to the 101st Airborne Division, the Screaming Eagles, at Fort Campbell, Kentucky, where he completed NCO School and was promoted to Staff Sergeant (E6). He returned to Fort Campbell to prepare for combat duty in Vietnam with the 2nd Battalion, 502nd Infantry Regiment, 1st Brigade, 101st Airborne Division. On September 18, 1965, after receiving a mortal wound, SSgt. Faircloth continued to command his squad in attacks upon, Vietnamese machine gun positions controlling the landing zone of Operation Gibraltar at An Ninh in the South Vietnamese Province of Binh Dinh. He was posthumously awarded The Silver Star for Gallantry in action by the department of the Army, the Army's third highest medal for combat Valor. SSgt. Faircloth is remembered to the nation on the Vietnam Veterans Memorial Wall, Washington, D.C., at Panel 2E, Row 87.